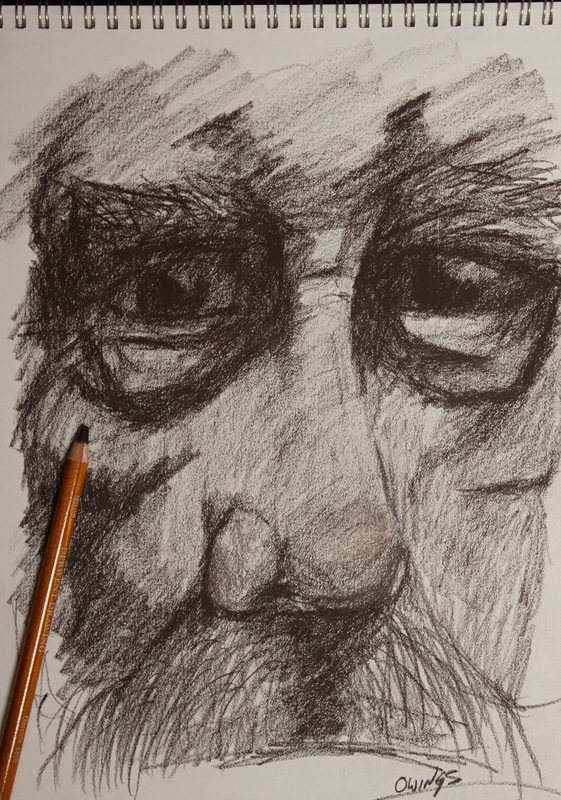 This is a quick sketch of a mans face. I wanted to draw this for two reasons. Firstly, this is an interesting face with lots of contrasting features and secondly I wanted to try out a new pencil. The pencil is a Derwent brand colored pencil made in England. It is a chocolate colored pencil #6600. The pencil has a larger diameter than a standard pencil and a thicker lead which lends itself to a very nice feel. It has a smooth line and a nice buttery feel. One drawback though, if you notice the very tip of the nose you'll note some pink where I tried to add an erasure highlight. The erasure I used just seemed to smear and not really erase much. 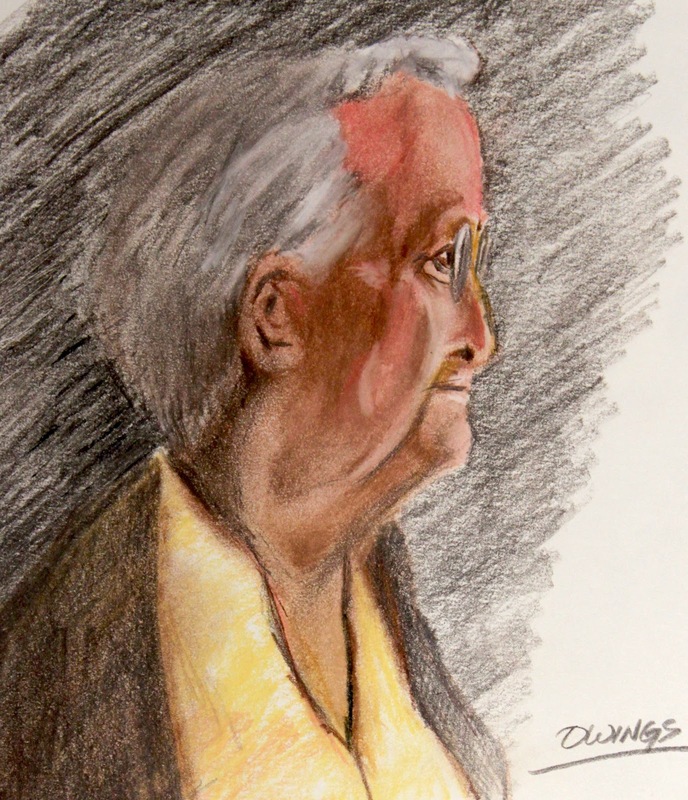 At any rate I also completed another drawing today called "A Grandmother". I am including it here, just as reference not necessarily as part of the project. At the end of the project I'll include all of the drawings I did that didn't make the cut. At any rate I'm adding it because I had fun drawing it and I tried to use a variety of colors in the face. 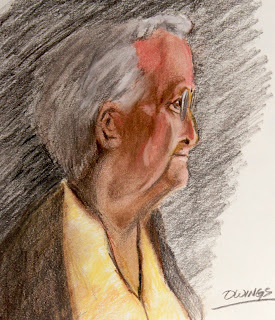 This pastel drawing took me about 2 hours to complete and involved a base sketch. Then I added some layers of pastel from light to dark. The light and shading needs more work, but it's a start and I think it captures the basic mood. I think it's just fun to try different subject matter, people, angles, lighting. Variety, as they say, is the spice of life and so it is with drawing. The best part about drawing and painting is that it is almost always very, very fun. It is also something that can evolve with you. As your ideas or tastes change, so can your style or the subjects you enjoy. One of the things I've learned as I've gotten older is that my art does not have to be perfect it just has to be. This works out well since I'll never be perfect at art or anything else for that matter. It's all a learning experience filled with wondrous adventures, big and small. I feel about my art, the same as you feel about yours. It will never be perfect, but that's OK, and I just have to do it. I do it for myself, and share it usually with just family. Hi Jayne - I got that great chocolate pencil at a place on Grand Avenue in Saint Paul called Wet Paint. It's a great little independent Art Supplies store. I'll add a link to their online store below. I also agree with you about the "why" you do art. If you enjoy it for yourself that's the important part, if others enjoy it then that's a bonus I think. The other thing about not trying to be perfect is that it frees you to experiment or just be as good as you can be without too much worry.